I haven't posted a lot lately for yarn along as I keep forgetting that it's on Wednesdays. For some reason, I have it in my mind that it's a Thursday thing! This week I reminded myself to be sure to post. Yesterday I got to cast on a project that's been sitting in my queue for quite some time. 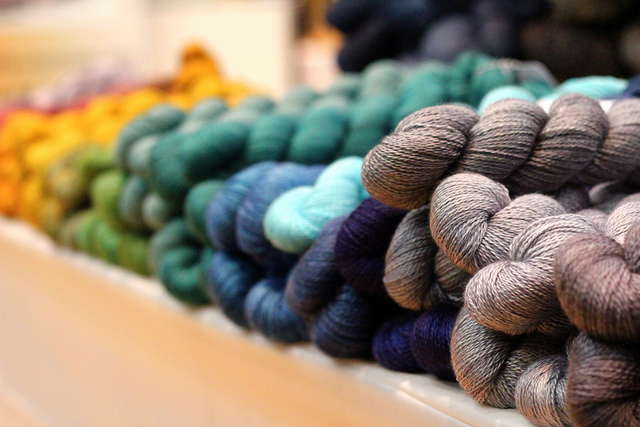 I had sort of forgotten about it until April's knitters frolic in Toronto, where a vendor was selling tiny little colour assortments of sock weight yarn. This way I could buy multiple colours for the project (each in their own very tiny hank-so funny!) without spending a fortune. It was fun to walk away from a booth having spent very little and yet being given four colours to work with! I love the slight variegation in each colour, it's nothing crazy wild, but adds a lot of depth. I just hope I bought enough-I'd much rather have leftovers than be short. I saved the business card of the vendor just in case. It took me a while to pick a main colour also-I wanted a neutral, but there were so many to pick from! The tables were like buffets of colourful candy selection, it was overwhelming! I ended up buying a slightly grey/white; "paper birch" from Sweet Fiber-a gorgeous little company based out of British Columbia. This was my first time trying their yarn but I really like it so far. It too is slightly variegated in tone which makes it all the more fun to work with. I also purchased the sweater yarn to make an "in threes" sweater for Lotte. I found this soft and gentle sweater yarn from Spud & Chloe. I love the colour name: Chocolate Milk. Perfect for a toddler! Last but not least-the Strathcona. Here's a beautiful pattern that I think I completely messed up. Yes, the basics are there, it looks *almost* right, but the mesh stitch is not. I'm not sure what I was doing wrong, but clearly something happened that wasn't supposed to. Yes, it's still lovely, but it the holes aren't square like they were supposed to be. As I was knitting it, I was carefully trying to figure out what I was doing wrong, because right away I noticed it didn't look right. But I couldn't for the life of me find what was happening. Then I thought perhaps it was because I had never knit mesh before, and maybe this is what it DOES look like before blocking. So I went ahead and finished it, blocked it, and it still didn't look right. I'm determined to make another and figure out what I was doing wrong. It was a fun knit, and I want to make another anyway! Can't wait to see more of your leftie! Your scarf looks beautiful, whether it is right or wrong. I just used some spud & chloe yarn for the first time. I loved it. Good luck with your projects! That Leftie is going to be lovely! I love your colour choices, the neutral is a really nice contrast to the brights. Lovely colours you are using... the scarf looks perfect. Enjoy your happy new projects. The Leftie is really cute! I have never seen that pattern before but will hang onto it - I love your color combinations, it is really bright without being "wild," if you know what I mean! All your projects are really beautiful.